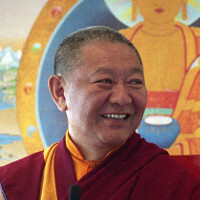 Ringu Tulku Rinpoche was born in Kham, Lingtsang, in 1952, and was recognised by the 16th Gyalwang Karmapa as the incarnation of one of the tulkus of the Kagyu monastery of Rigul, in Lingtsang. He received teachings from the Gyalwang Karmapa, Kyabje Dilgo Khyentse Rinpoche, Kyabje Dodrupchen Rinpoche, and many eminent Khenpos. He was awarded the title of Khenpo by the 16th Gyalwang Karmapa, and Lopen Chenpo (PhD) by the International Nyingmapa Society in 1983.Rinpoche’s fluent English and warm, friendly teaching style is appreciated at Dharma centres around the world. Since 1990 he has taught Buddhism and meditation at more than 50 universities, institutes and Buddhist centres in Europe, USA, Canada, Australia and Asia.